Question: I am installing new door trim and baseboards and I read an article that said I should install the architraves first, before I install the baseboard. The problem I have is that I can’t figure out what "architraves" are? I feel rather stupid, I looked it up in the dictionary and it still didn’t make any sense to me. Please help! Answer: I’m guessing that the article you read was written in the UK. An architrave, when discussing door trim, is the lower piece of a multiple set of "fancier" door trim that is especially common in Europe and in finer homes in North America. Using a nice set of trims or moldings around doors used to be the standard method of finished carpentry. However, installing a nice set of door trims is labor intensive and if done properly requires a skilled carpenter. This costs money so builders chose to use inexpensive door trims in order to reduce costs. Figure 1 shows an architrave as part of a door trim. 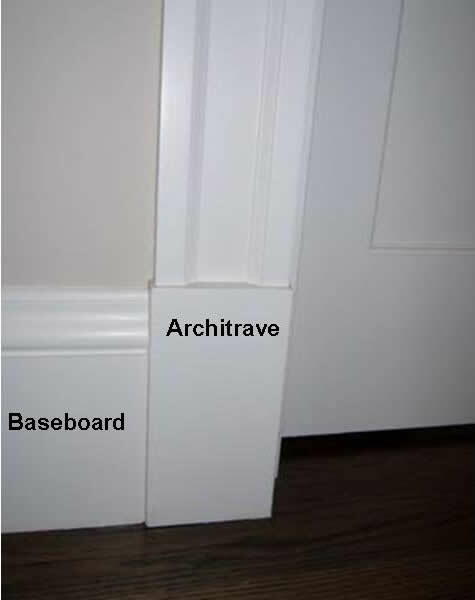 What the article is saying is that the baseboard butts up against the side of the architrave rather than having the architrave resting on the top of the baseboard.